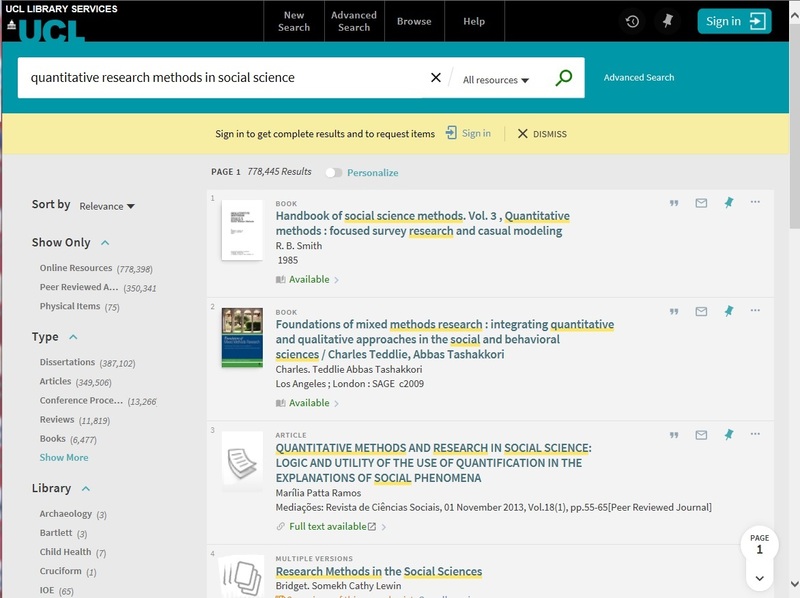 Explore is UCL Library Services' single search tool for finding journals, books, full-text articles, archive material and much more. Whether you're looking for items on your reading list or information for a project or research, you'll find it in Explore and you get instant access to any full-text the library subscribes to. For more information about access, click here. Sign in to make the most of of your search, you'll get a more complete set of results and you will need to sign in to find the availability. Once you've signed in you will be able to save the results of a query or save the details of an individual item record to "Your Favourites" - look for the pin! . Use the filters on the left hand side of the screen to narrow down your search results. The "Advanced Search" option allows you to set more specific parameters in your search. The "Browse" option allows you to browse our collections by subject heading, author, title or shelfmark. 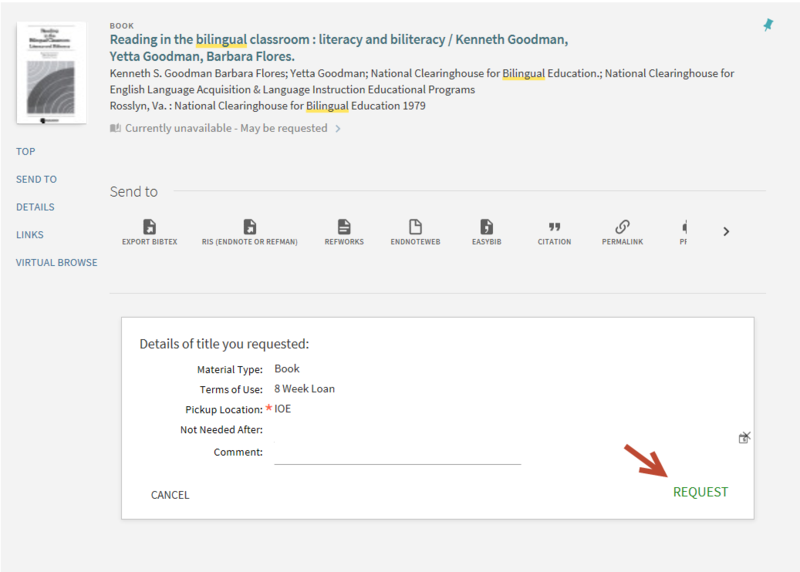 If you are looking for IOE books in our new search, please see this helpful guide on keyword and subject searching for items held in the IOE collections. You can locate databases using search too - including the British Education Index and ERIC. Alternatively, you can still find an A-Z list on the UCL Database Page. If you find that that the book you want is out of the library and there are no copies available in any other UCL libraries, you may want to place a request for that title. You cannot place a request for books on the shelves in the library. Sign in with your username and password, find the item you want to request and then click 'Request'. You will receive an email when the item is in the library and you'll be able to collect it from the shelving arranged in alphabetical order in the Welcome Desk area. Requests will be kept for one week. If there are multiple requests for a title, all requests will be limited to one week for standard (8 week) items. Once you click 'Request', you will see a screen as below which allows you to put in a date: 'Not needed after . . .'. You can search for items that contain at least one of the words or phrases you require. If you have multiple terms that are synonomous, type OR between the words or phrases. If you search for words or phrases without specifying OR or NOT, Explore assumes that you are searching for all the specified words or phrases. To search for a phrase, type double quotation marks around the phrase. You can combine both words and phrases in your search. If you do not enclose the phrase with quotation marks, the system will find items that contain the individual words in the phrase, regardless of whether these words are located next to each other in the order specified. To search for a specific article using its DOI, type the full DOI into the search bar and click Search. If your DOI search doesn't bring back any results, try searching for the title or ISSN of the journal as it may be held in print format. Searching on a journal's ISSN will retrieve results for both the overall title and any articles available electronically. To search using an ISSN, enter the full number (including hyphen) in the search bar and click Search. Searching by a book's ISBN is a good way to find a specific edition or version. To search using an ISBN, enter the 10- or 13-digit number into the search bar and click Search. You can exclude items that contain specific words or phrases. To do so, type NOT and then type the word or phrase to exclude. If you search for words or phrases without specifying OR or NOT, Explore assumes that you are searching for all the specified words or phrases. You can refine your search by resource type and library. Because the library holds a number of specialist collections (Curriculum Resources, Comparative, Special Collections, etc. ), collections are classified and separated in order to group similar resources together. For this reason, it is essential that you search online rather than solely browse the shelves as there will not be one place for one subject. IOE Library classification schemes vary with collections. Shelfmarks are based on letters, numbers or a combination of the two. To find an item, write down the shelfmark and location. Remember that you need to log in with your username and password to get the full record with loan type. COR are the first three letters of the author's surname. 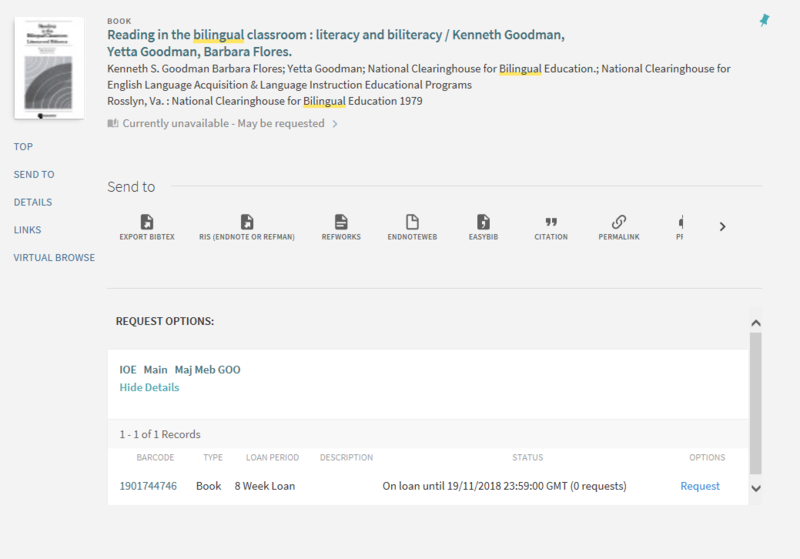 In Explore, note down the library and the availability in the library record. If the item has a due date, that means it is out of the library and can be requested. If the item is in IOE Store, it must be requested at the IOE Help Point or via ioe.lib-enquiries@ucl.ac.uk in advance.